Sassafrass is delighted to announce that we now have an online method set up for pre-ordering the CD and DVD of Sundown. The Kickstarter has closed, but since we continue to receive frequent requests from people who want to order the discs in advance, we have set up our “merchandise” page on Bandcamp to offer the CD and DVD for physical pre-order. Both are priced at $20, with $6 domestic shipping. As of right now we do not have an option for combined shipping if you order both at once. This is because we expect the DVD to be available several months before the CD, so, for those who pre-order both, we will ship each as it becomes available. We do not yet have it set up to let you pre-order the digital download, but if you want the digital version you can request to be put on a mailing list and we will let you know as soon as is it available. Meanwhile, our preview album contains three finished tracks from the final CD, the character themes and a bonus rough cut of the creation myth song “Ice and Fire”. 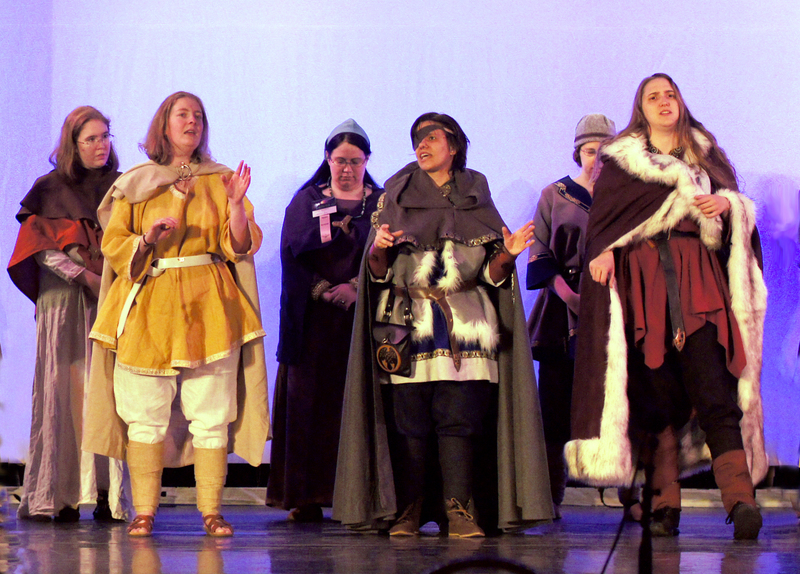 Baldur, Odin and Loki in their traveling cloaks, with chorus. A few updates to share. 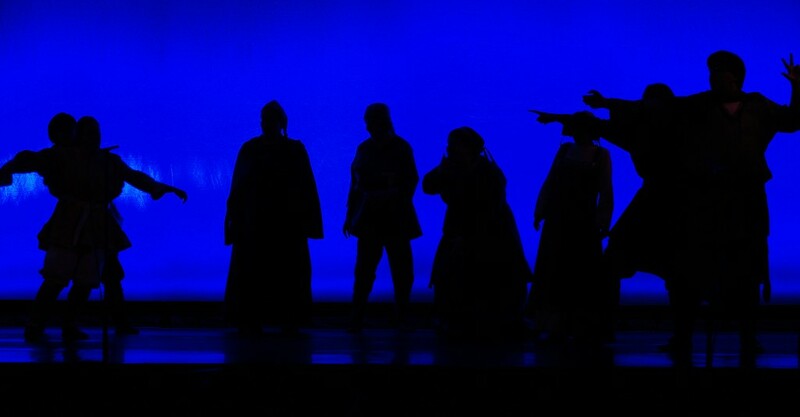 First, a very fun literature and culture blog “Bible, Literature and Translation” has done a piece on Sundown with an interview with composer Ada Palmer talking about the source and background of the play. You can read it here. Especially for those who couldn’t make it to the panel about Sundown after the play at Balticon, the interview looks at textual issues as well as underlying idea behind the structure of the play and music. Second, we are now one week from the end of our Kickstarter fundraising campaign, and we’ve passed $13,000. We’re overwhelmed by how powerful the response has been, and how much we’ve managed to exceed our goal. 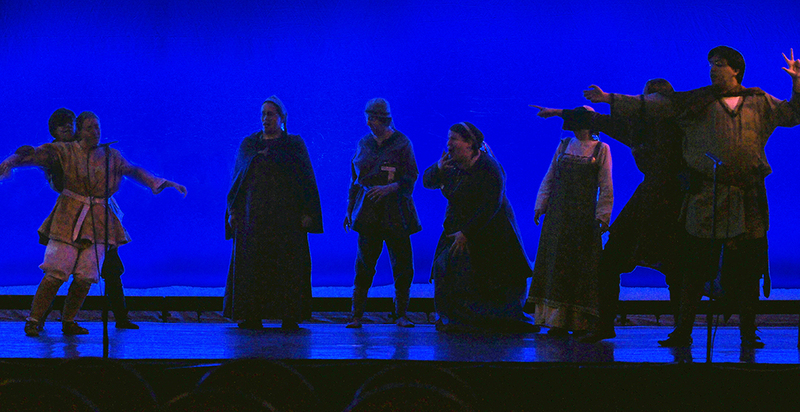 Having extra resources has let us start thinking about the next performance, and talk to cons and other venues about where we might perform Sundown next. We had expected it to be many months until we had another venue, but with these resources in hand we’ve been able to accelerate our plans for a second performance. For this reason we hope donations will continue to climb in the last week of the kickstarter, since every donation increases the chance that we can travel to perform at more and bigger cons. 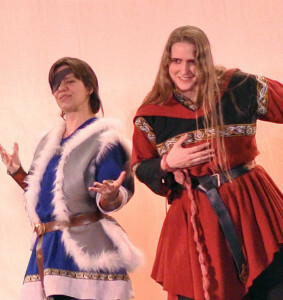 And since we’ve passed $13,000, several of Jo Walton’s Norse poems about Odin and Ask and Embla have now been shared with our backers. We are really hoping we can hit $14,000 so she will write her Loki poem. A big thanks to everyone who has supported us so far. We have big plans, thanks to you! We hope to have some finalized enough to announce soon, so stay tuned! 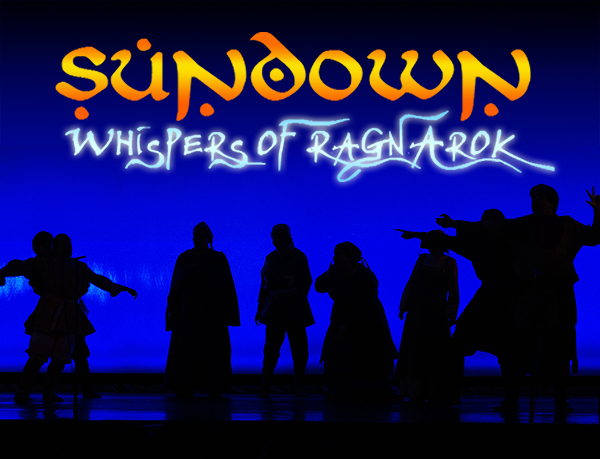 I am delighted to announce that our first performance of the full stage play Sundown: Whispers of Ragnarok was an enormous success. Balticon was a fabulous host at every stage, from enthusiastic tech staff who were eager to help us develop exciting lighting effects, to enthusiastic friends new and old who helped with last-minute logistics, to the most enthusiastic audience we could have hoped for. 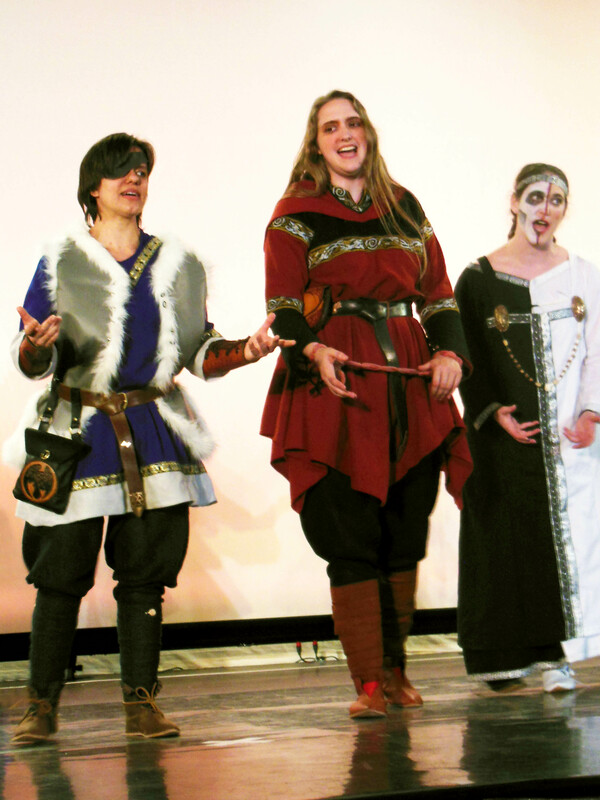 We especially want to thank several SCA Viking costuming and wireweaving experts who were at the convention, and helped us solve several last-minute costuming issues. In the end, our historic costumes all came out delightfully, and we were able to display many signature elements of Viking clothing. A huge thank-you to everyone who helped make this possible! Lauren, Ada and Kara as Odin, Loki and Hella. Our DVD film director Dave Kowarsky reports that the video came out extremely well, and he has high hopes for the DVD. We had four cameras going throughout the performance, to capture different angles, close-ups and distant shots, so over the next month he will work on cutting and splicing different shots to assemble the best possible video. At the end of June our composer, Ada Palmer, will get together with Dave at his editing studio in New York to help finalize the cut, and work on DVD extras. Now we want to do it again! With the first performance behind us, we’re eagerly investigating venues for a second performance. We have already received several invitations, but getting so many performers together requires a lot of planning, so we don’t yet know where we will be able to next perform Sundown. We are also concentrating on recording, and have a rigorous recording schedule planned for the summer, so we expect to make great progress toward the CD. We also have great Kickstarter news! The Kickstarter funding campaign we launched two weeks ago has been a staggering success. We were staggered by the response, and met our $7,000 starting goal in only 48 hours! We’re genuinely overwhelmed by the support we’ve received. This guarantees that we can produce the CD and DVD, but now we are working on stretch goals, to raise more so we can help finance further performances, DVD extras and professional digital mastering for our audio CDs. As of this morning we hit $11,000, which means composer Ada Palmer will write 24 pages of historical and mythological notes about the making of the play, to be printed in the libretto and shared in PDF with our backers, and Hugo- and Nebula- award-winning author Jo Walton has written two poems about Odin to share with readers and backers (read the first one here) and she has promised more as the campaign continues. We still have 16 days to go, and we hope pledges will continue to climb, since every dollar increases the chances that we can afford to perform the play again soon. We have exciting rewards planned if we hit $12,000 or more, including more poems by Jo, and more DVD extras, so for details please check the Kickstarter Updates, and please continue to share our Kickstarter link with friends and families – this Kickstarter is a great opportunity for us to reach new audiences, and share our music through pre-orders of the CD and digital downloads. Once again, a huge thanks to all our supporters, at Balticon and around the world. Sundown has been a greater success than any of us could have imagined, and we could never have done it without your support. Thank you! Uncategorized Comments Off on Kickstarter Launch! 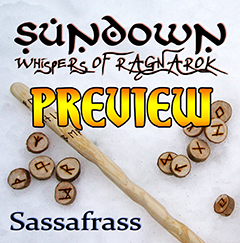 An exciting day: Sassafrass is launching a Kickstarter to support Sundown: Whispers of Ragnarok! 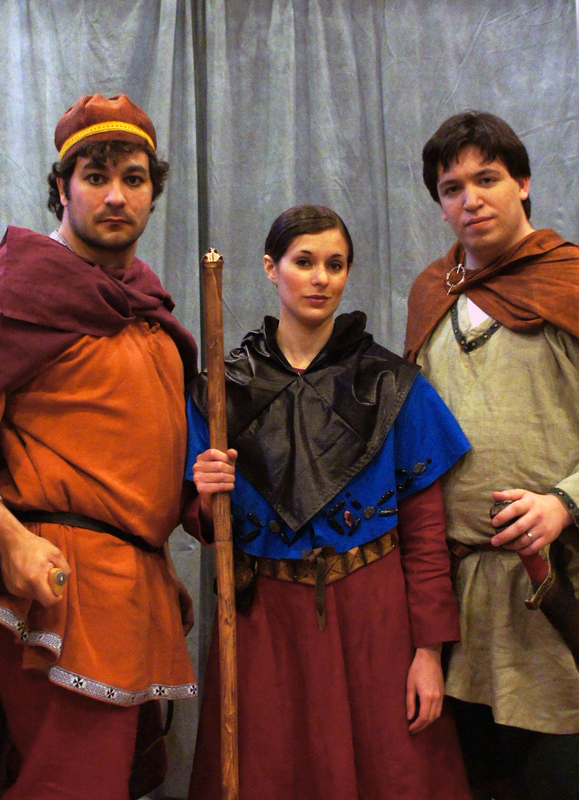 We have some really exciting plans for Balticon and for the CD (period-accurate costumes, eco-friendly packaging, filming the play to make a DVD), and we need your help to make them happen. This is our first time trying out something like this and we have high hopes that with our fans backing us up through Kickstarter, our most ambitious project yet can get off the ground. Check out our project page and preorder your CD and DVD now! For just $1 or more we will thank you personally on the Contributors page of our website, and at higher levels we will also thank you in the CD and DVD. For just $10, you can pre-order a digital download of the finished album, while for $25 you can pre-order the CD itself, or for $50 the CD and DVD. 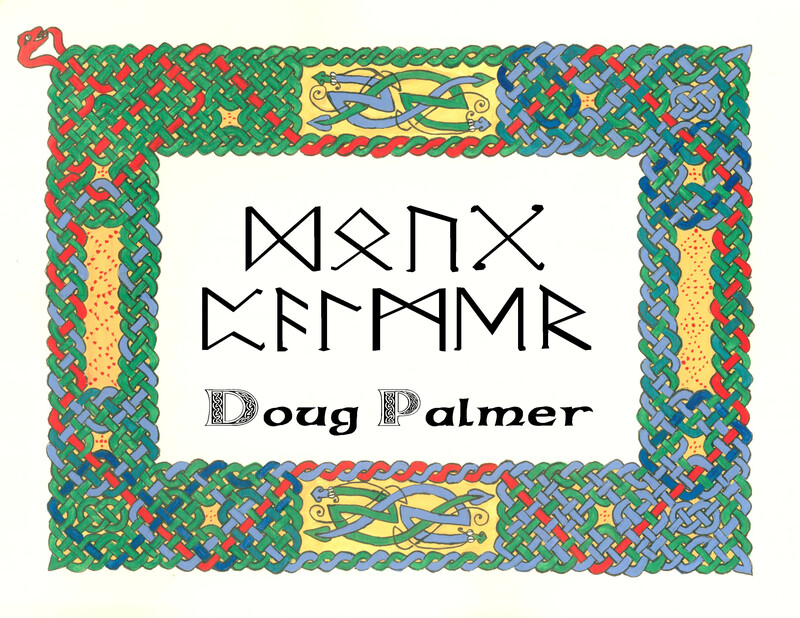 Exclusive thank-you items include a certificate with your name in Runes, and, at high levels, advanced digital access to the tracks as we finish them, before the CD is released. We also have exciting stretch goals planned! 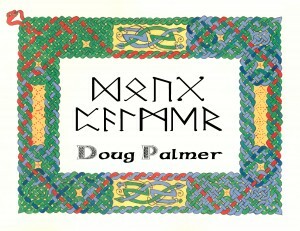 “Your name in Runes.” One of our ways of saying thank-you to our Kickstarter backers. We have uploaded a lot of new music samples to go with the Kickstarter, as well as lots of new info about the Sundown Project. 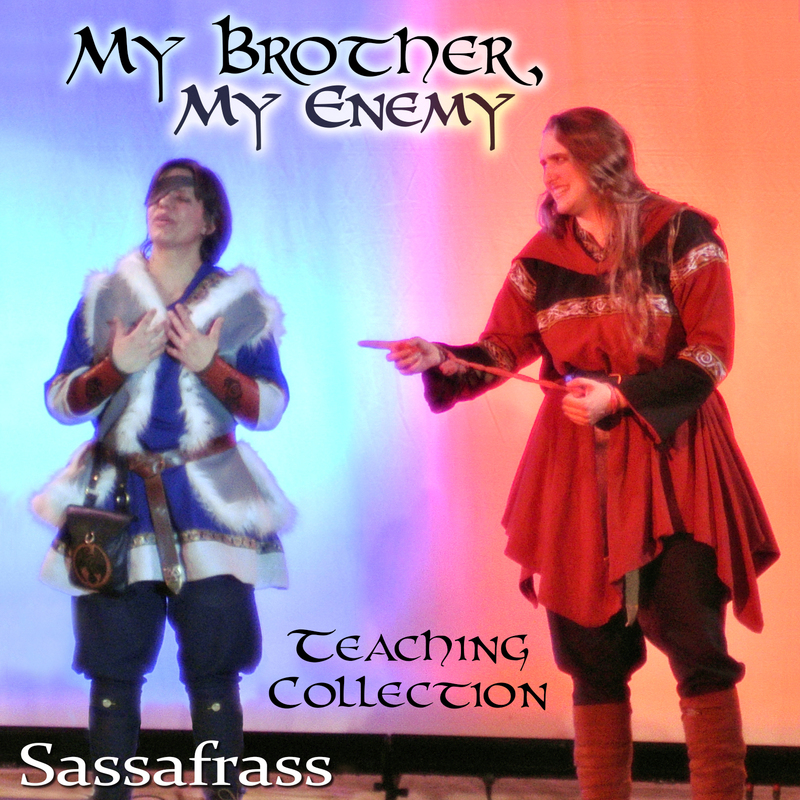 Both on the Kickstarter page and on our new main page you can hear streaming samples of the new recording of My Brother My Enemy, which demonstrates our new recording tech, plus the new Futhark Song and a sample of the finale of the cycle, Longer in Stories than Stone. Our info page about the Play also has new recordings of the Character Themes, and you can hear all the new samples on the Sundown Preview digital album. For more information, check out our Kickstarter page, and thank you for helping us bring Ragnarok to life! But there’s even more news: Three New Digital Releases! 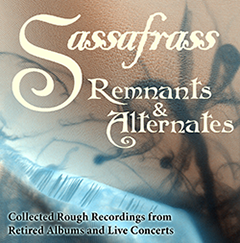 To replace our retired albums, Sassafrass has three new online albums available through Bandcamp. Sundown: Whispers of Ragnarok – Preview is our way of sharing what we have of the still-in-progress Sundown Norse Myth Song Cycle. It contains the final recordings of “My Brother, My Enemy” and both versions of “The Futhark Song” (the sweet one and a new eerie modal arrangement), just as they will appear on the final CD. It also contains recordings of the seven Character Themes which recur throughout the song cycle, letting you spot the influence of each character in the larger pieces. 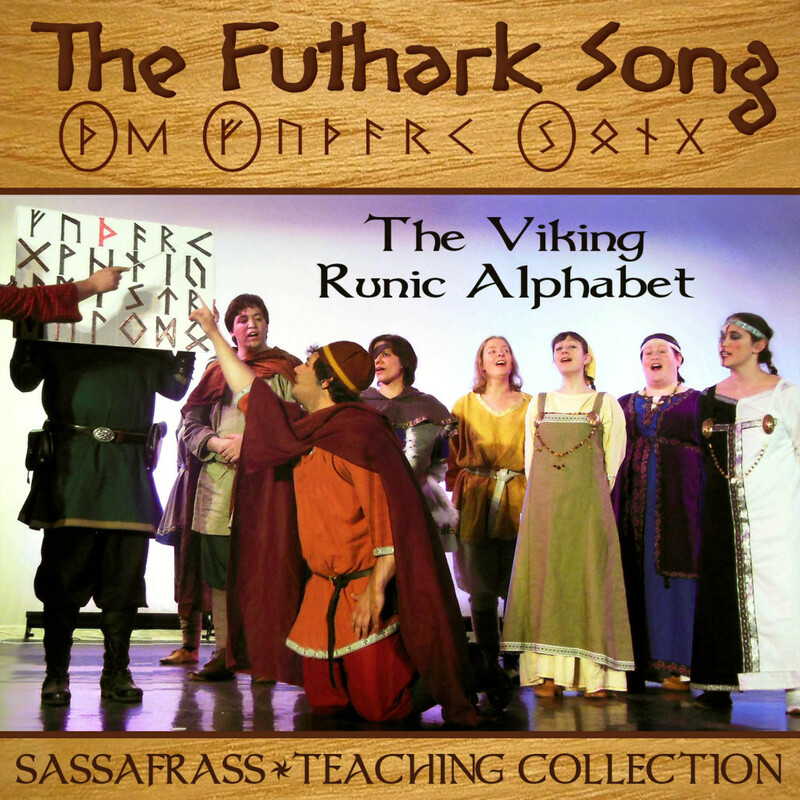 As a final bonus, it contains a sample of the six-part finale piece “Longer in Stories than Stone” which is still in production, plus it comes with downloadable PDFs including a lyrics sheet for “My Brother, My Enemy,” one for “The Futhark Song” featuring the original runic characters, and the sheet music for the Character Themes. Make Them All Real collects the best tracks from our past albums, digitally remastered by our new sound editors. They have been re-balanced for volume, filtered for improved microphone quality, and have enhanced clarity of sound and lyrics. 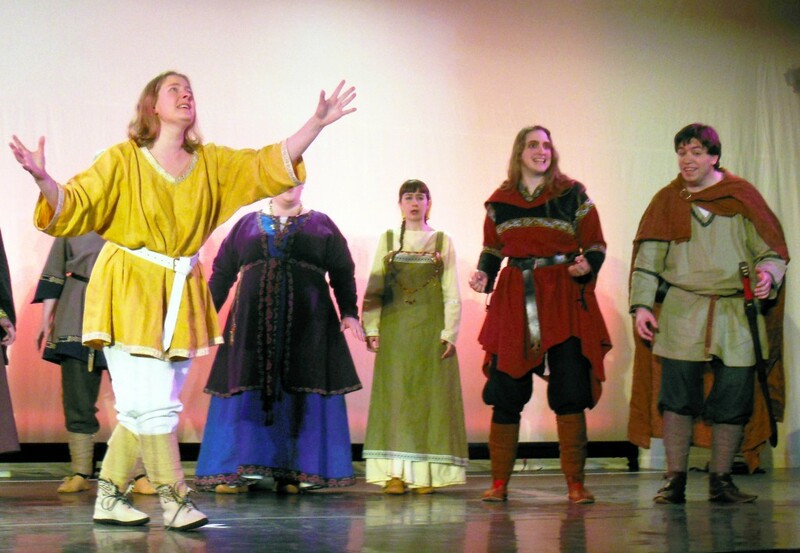 In addition to such favorites as “Somebody Will” and “Fall”, this collection contains a new recording of one of our Norse pieces, the solo version of “A New World (Frigg’s Song), which will appear as a trio on the finished Sundown CD. As a bonus, the complete album purchase comes with downloadable PDFs of the lyrics sheets with guitar parts for “Somebody Will” and “Threadbare Dragon,” formatted to help you learn and perform them. Remnants and Alternates collects favorite rougher takes from all our old collections, trying to gather the best take of each of the pieces we have not yet had a chance to rerecord, plus favorite old versions, gathering selections from six different albums into one. It also contains two live concert recordings never before released online! All three are available for $5 each through our bandcamp site, and sales help pay for the production of Sundown. A fourth collection is coming soon! We often receive requests from friends and fans who still want access to retired rough tracks, which may not be our cleanest, but are still fun. We are gathering a selection of the best retired tracks and will soon make them available on our website, both streaming and for free download. Stay posted! 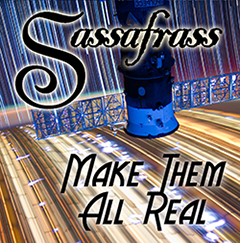 It’s a big day, and this is going to be the most exciting month Sassafrass has had, with the Kickstarter, three digital releases, and the long-awaited debut of the stage version of Sundown at Balticon. None of this would be possible without the support and encouragement of our many friends, so thank you for being part of this project, and we hope you enjoy!